Do you play a musical instrument? Do you enjoy playing chamber music? Do you like making up music? 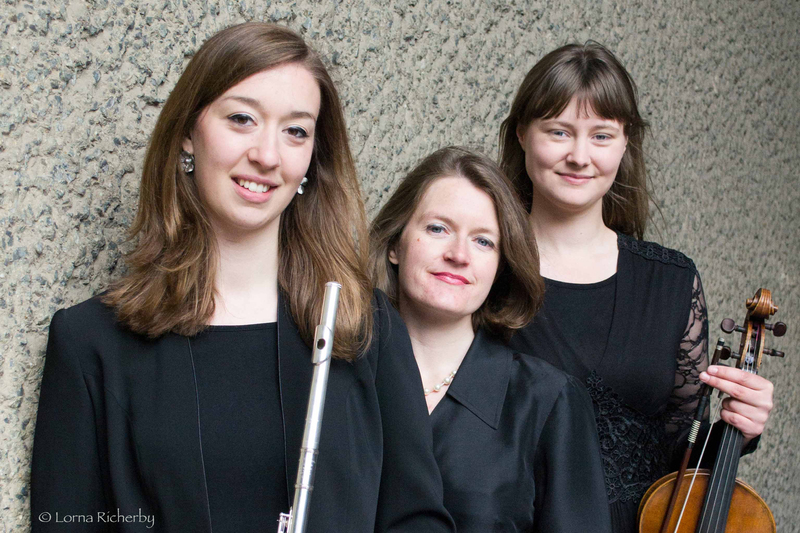 The Duruflé Trio comprises Clare Simmonds (piano), Rosie Bowker (flute), and Henrietta Hill (viola) and was formed at the Guildhall School of Music and Drama, where the players met. They are all keen improvisers, and include trio improvisations as part of every performance. As enthusiastic supporters of contemporary music, the trio usually includes works by living composers in each concert, and they plan to commission new works for this rich combination of instruments. For more information, visit www.durufletrio.com. A chance to discover Classical improvisation The need to stick to the notes in the score is often a barrier to music-making, but it can be a real challenge to be asked to make music up or improvise. All three members of the Duruflé Trio are passionate about the art of Classical Improvisation. Since 2014 they have been improvising as a group in their concerts, producing minuets, rondos, and ‘free-form’ works. They even take musical ideas from audience members to create completely spontaneous pieces of music. This art is not risk-free, but that makes it all the more gripping for performers and audience alike! All you need is enthusiasm! This workshop offers an opportunity to discover a specific piece of music (Maurice Duruflé’s Prélude, Récitatif et Variations, op. 3), exploring the ways in which a musical theme is adapted to create an entire work. You’ll then look at creating and improvising your own variations, in small groups, based on the same musical theme. All workshop participants will have the opportunity to perform a group improvisation in the Duruflé Trio’s afternoon concert in Sherborne Abbey. Clare holds an MMus in Piano Accompaniment from the Guildhall School of Music and Drama. Clare received distinction for an MMus in solo piano in 2014 at Trinity Laban Conservatoire of Music and Dance. Whilst there, she received the David Gosling award (2013) and Founders Prize for Accompanists (2014). Rosie is originally from Sherborne and performs regularly as a soloist and in ensembles. She has performed with the London Symphony Orchestra, the Orchestra of the Age of Enlightenment and on BBC Radio 3. Rosie is a recent graduate from Christ’s College, Cambridge. She studies at the Guildhall School of Music & Drama and is a member of the Young Musicians Symphony and Sinfonia Cymru. Violist Henrietta, from Derbyshire, graduated from the University of Cambridge with a BA(Hons) in Natural Sciences in 2014, where she held an Instrumental Award. She has performed with the Wihan Quartet, The Bridge Quartet, the Hill Piano Quartet and the Fourier Quartet. Henrietta loves exploring contemporary music and is grateful to the Stephen Bell Charitable Trust and Guildhall School for their support with her studies.